MLB.com's latest Top 100 Prospects list revealed one big truth about the state of the game -- it's tough out there for an up-and-coming first baseman. Only one full-time first baseman made the list, No. 51 Peter Alonso. Brendan McKay also checked in at No. 29, but that ranking came more on the strength of his potential on the mound as a left-handed pitcher than that of his bat and play around the bag at first. First basemen, of course, have to produce much more at the plate than their other peers around the diamond to make up for their typical lack of defensive impact. For example, the FanGraphs' calculation for WAR bakes in a positional adjustment of -12.5 runs for a first baseman. That's five runs lower than any other defensive spot on the field. If first-base prospects are going to be of value -- and avoid getting squeezed out by more athletic players that change positions later in their careers -- then they're going to have to do some serious raking. That's why Alonso -- whose 36 homers tied him with Ibandel Isabel for the Minor League lead last season -- got into the Top 100, but No. 2 first-base prospect Evan White, who has Gold Glove potential but might just be an average hitter long-term, got left out. Standing out as a member of a small group within a huge talent pool? 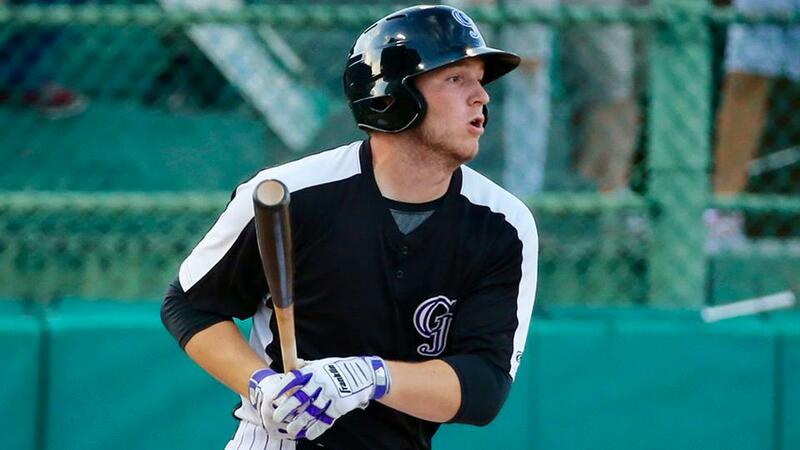 Rockies prospect Grant Lavigne knows a thing or two about that. He's working on becoming the first New Hampshire native drafted out of high school as a position player to reach the Major Leagues. As he enters his first full season, he's well on his way to chiseling his name into Granite State history. "Going from high school to [Rookie Advanced Grand Junction in 2018], I didn't know what to expect," he said. "New Hampshire high school ball, especially, is completely different than pro ball. I had no idea what I thought could or should happen. But I kept my approach with my same swing and started well and ended up keeping doing well as long as I was there. It's been a fun start." Before Lavigne could stand out in the Minors, he needed to stand out enough nationally to put himself on Draft boards -- a fairly tall task for someone from the small town of Bedford, considering that before him the last New Hampshire high schooler taken in the top two rounds of the modern Draft was Chris Carpenter, at 15th overall in 1993. The left-handed slugger, whose Little League team fell one win shy of Williamsport in 2012, did himself some favors when he was named All-State as a freshman in 2015 and the Gatorade State Player of the Year as a sophomore a year later. (Among the other winners that year: Alex Kirilloff, Mickey Moniak, Khalil Lee, Riley Pint and Bo Bichette.) In 2017, he was invited to showcases like the Area Code Games and East Coast Pro, displaying power and an overall good bat from the left side. That August, he grabbed attention by using a wood bat and homering into the second deck at Yankee Stadium in front of scouts. In November, he committed to Wake Forest, and last spring, he was crowned Gatorade State Player of the Year for the second time. Heading into the first day of the 2018 Draft, he was a 6-foot-4, 220-pound slugger hitting .639 with seven homers. In other words, he was a monster of a hitter with a monster of a resume. And yet as he waited for the Draft Day call, Lavigne couldn't help but continually return to his perceived weaknesses. He'd played some third base and left field to show scouts that he could be versatile. Would that be enough? "I remember the summer before that the knock on me was that, 'He's not athletic enough; he's not fast enough,'" Lavigne said. "But I could always hit. So that offseason, I worked on my speed, my agility, trying to show I'm more than just that." Whether that helped or whether the offensive dominance alone was enough, the Rockies came calling in Competitive Balance Round A, taking Lavigne with the 42nd overall pick. Two weeks later, he signed for $2 million, taking a bonus above the $1,700,400 recommended for the slot to walk away from his Demon Deacons commitment. In tweeting about signing his first pro contract, Lavigne made sure to end the message with the hashtag #603 for the sole area code of New Hampshire. Colorado didn't set out any expectations initially for the then-18-year-old, but it didn't take long for him to put two and two together. "I got the call a couple picks beforehand, but they never said anything about a position then," he said. "I could tell after a while, though, that they envisioned me as a power-hitting first baseman and that I was probably already too big for the outfield. They want me to stick to one position and really master that, so that's what I'm working on doing." It didn't take long for him to live up to the hype, either. After debuting with Grand Junction on June 23, Lavigne went 4-for-8 with a triple in his first two games. He homered in three straight from June 29-July 1 and was hitting .400 as late as July 12. In August, he was named a Pioneer League midseason All-Star and would later earn postseason All-Star honors as well. Lavigne finished with a .350/.477/.519 line with six homers, two triples and 13 doubles in 59 games. Perhaps in an effort to show off his athleticism, he also stole 12 bases, which was 12 more than any other first baseman in the Rookie Advanced circuit. The offensive numbers of Grand Junction sluggers are often are met with some skepticism, considering playing at Suplizio Field gives hitters a distinct advantage. But Lavigne's performance was more than just that of a batter taking advantage of thin air. Sure, his .996 OPS ranked third in the league, but most of the heavy lifting there was done by his OBP. Lavigne led the league at .477 in that category, and his next closest qualified competition, Missoula's Zack Shannon, checked in with a much lower .439 mark. Lavigne walked more times (45) than he struck out (40) over 258 plate appearances last summer, making him one of only two out of 45 qualified hitters to post a BB/K ratio above 1.00. His 17.4 percent walk rate led the league, too. This wasn't just a slugger hitting the ball deep into the Colorado sky. This was a hitter with a truly advanced approach atypical for a player fresh out of high school in any corner of the country, never mind the Northeast, where colder climates make it difficult to get the repetitions necessary to develop such an approach. The Rockies were certainly excited to add Lavigne to their system but were downright ecstatic with the way he performed in his first taste of pro ball. "There's some big names that he reminds me of, and I don't even want to throw them out there because it's too early," Colorado senior director of player development Zach Wilson told MiLB.com when Lavigne was named an Organization All-Star. "I'll put it this way: I have never in my seven years of development and really in my 10 years of scouting prior to that, have I seen a kid this age that has the extremely advanced approach that he has. That's saying something, and I think that's only going to continue to improve as he gets older. I think this is a guy that at a full season could walk 100 times." But walks are not Lavigne's primary goal. "I'm usually an aggressive hitter, but only when I get what I'm looking for," he said. "I want to see a fastball early that I can drive. But otherwise, I'm taking my balls and waiting for my pitch to come to me. I'll let pitchers keep throwing pitches until I get what I'm looking for, and once I do, that's when I'll go hunting. It was very nice to see the results come with that approach. Knowing my swing can play at that level, I don't need to go into this offseason worrying about that. I'm not going to worry about changing anything major. It's more about cleaning up my swing, trying to make it as efficient and as short to the ball as I can get it mechanically." This offseason, Lavigne's preparation for his first spring has continued to take on a distinctly New England feel. Having just returned home after spending two weeks in Arizona working with the Rockies, Lavigne is back to rotating between hitting at indoor facilities in Nashua, New Hampshire, and Littleton, Massachusetts, while getting in his fielding work a few times per week in nearby Lowell. He's also managed to work in clinics with the Bedford Little League program, giving hitting tips to local kids hoping to make their own ways toward Williamsport and beyond. When he was their age, he idolized Bryce Harper, David Ortiz and J.D. Drew -- all mashers from the left side who played on the big stage down I-95 in Boston or Washington. If Lavigne can build on the potential he's already shown in the Minors -- and entering 2019 as MLB.com's No. 8 first-base prospect, he's well on his way -- those New Hampshire kids might not think the road to the Majors is so far off from their neck of the woods. "That's another part I really look forward to, beyond just playing," Lavigne said. "I want to be the first hitter from New Hampshire to make it. I'd love to prove to scouts and everyone in baseball that kids in New Hampshire can play baseball, too. They may not have as many reps, but they can get it done here. I can show them that."